Inhibition of spore germination offers an attractive and effective target for controlling fungal species involved in food spoilage. Mushroom alcohol (1-octen-3-ol) functions as a natural self-inhibitor of spore germination for many fungi and, therefore, provides a useful tool for probing the molecular events controlling the early stages of fungal growth. In Penicillium spp., the R and S enantiomers of 1-octen-3-ol delayed spore germination and sporulation in four species of Penicillium involved in soils of fruit and grains, but to different degrees. Because of its well-annotated genome, we used Penicillium chrysogenum to perform a comprehensive comparative transcriptomic analysis of cultures treated with the two enantiomers. Altogether, about 80% of the high-quality reads could be mapped to 11,396 genes in the reference genome. The top three active pathways were metabolic (978 transcripts), biosynthesis of secondary metabolites (420 transcripts), and microbial metabolism in diverse environments (318 transcripts). When compared to the control, treatment with (R)-(-)-1-octen-3-ol affected the transcription levels of 91 genes, while (S)-(+)-1-octen-3-ol affected only 41 genes. Most of the affected transcripts were annotated and predicted to be involved in transport, establishment of localization, and transmembrane transport. 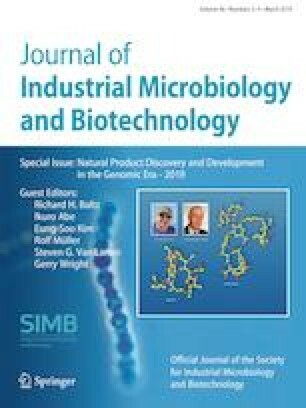 Alternative splicing and SNPs’ analyses indicated that, compared to the control, the R enantiomer had greater effects on the gene expression pattern of Penicillium chrysogenum than the S enantiomer. A qRT-PCR analysis of 28 randomly selected differentially expressed genes confirmed the transcriptome data. The transcriptomic data have been deposited in NCBI SRA under the accession number SRX1065226. Guohua Yin and Yuliang Zhang have contributed equally to this work. The online version of this article ( https://doi.org/10.1007/s10295-019-02168-4) contains supplementary material, which is available to authorized users. This work was primarily funded by the Special Fund for Agro-scientific Research in the Public Interest of the People’s Republic of China (Grant No. 201403075) and partially funded by the USDA-ARS Cooperative Agreement (Grant No. 2-47012). The funders played no role in experimental design, execution, data analysis, or decision to publish. Use of a company or product name by the U.S. Department of Agriculture does not imply approval or recommendation of the product to the exclusion of others that may also be suitable.